UD's Tsu-Wei Chou has been selected to receive the Nadai Medal from the American Society of Mechanical Engineers. 9:46 a.m., Nov. 18, 2013--Highly cited researcher. World Fellow of composites. One of the top 100 materials scientists of the decade. Tsu-Wei Chou has received all of these accolades and many more during his four-decade career, and he recently added another one  Nadai Medal from ASME. 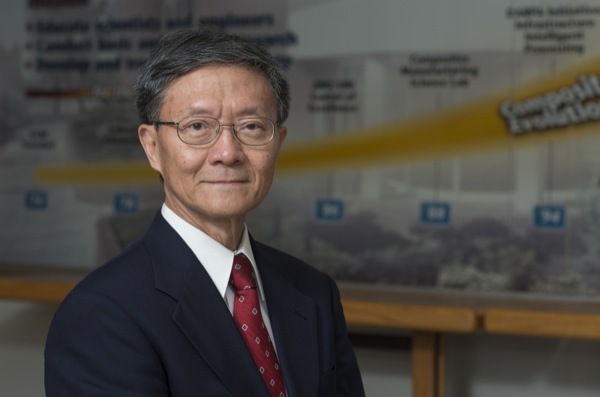 Chou, who is the Pierre S. du Pont Chair of Engineering at the University of Delaware, will share his perspectives on composites science and technology during the Nadai Medal Lecture at the 2013 ASME Mechanical Engineering Congress and Exposition in San Diego on Wednesday, Nov. 20. Chou’s involvement in composite materials dates back to his graduate school days at Stanford University in the late 1960s, when he asked his professor about future research directions. That excitement has been at the foundation of this composites pioneer’s work for the past 43 years. He has worked with a wide variety of materials and geometries, including hybrid composites, textile structural composites, flexible composites, and most recently nanocomposites. He and his research team have demonstrated unique applications of carbon nanotube-based continuous fibers in multifunctional composites and energy storage devices. Chou joined the UD faculty in 1969 and was a founding member of the Center for Composite Materials (CCM). In addition to his technical achievements, Chou is credited with pioneering and sustaining many of the international collaborations that have made CCM recognized throughout the world. The author of over 335 journal articles and several books, Chou is editor-in-chief of Composites Science and Technology. A fellow of six professional societies, he has received the Charles Russ Richards Memorial Award and the Worcester Reed Warner Medal from ASME, the Distinguished Research Award from the American Society for Composites, and the Medal of Excellence in Composite Materials and the Francis Alison Award from the University of Delaware. Established in 1975, the Nadai Medal commemorates the achievements of Arpad L. Nadai, a pioneer in the field of engineering materials. Recipients are recognized for significant contributions and outstanding achievements that broaden the field of materials engineering.